Bangalore is home to many Bengalis and as Dusshera approaches, a number of Durga Puja pandals are beginning to appear around the city. Read on to find out what to expect and where to you. October is a festive season across India. What’s amazing is that different parts of India celebrate the Dusshera season in different ways. In Bengal, Durga Puja Pandals are the highlight of this season. However, you don’t have to travel all the way to Kolkata to be a part of these festivities. Over the years, a number of Bengalis have shifted base from Bengal to other parts of the country. Bangalore has a large migrant Bengali population. 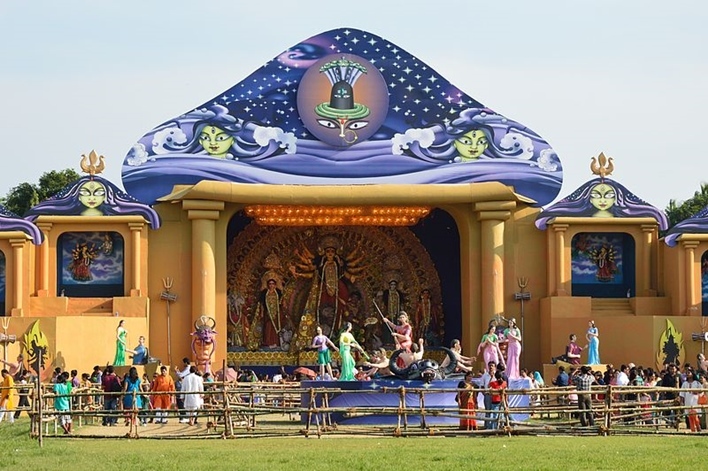 Hence, it comes as no surprise that the city has a number of Durga Puja Pandals. Bangalore has always been a cosmopolitan city. According to a census taken as early as 2001, about 50% of the city’s population was non-Kannadiga. Over the years people have moved to Bangalore from Tamil Nadu, Andhra Pradesh, Kerala, West Bengal etc. Today, there are a few lakh Bengalis in Bangalore. This goes to prove the warm and inclusive nature of this city. 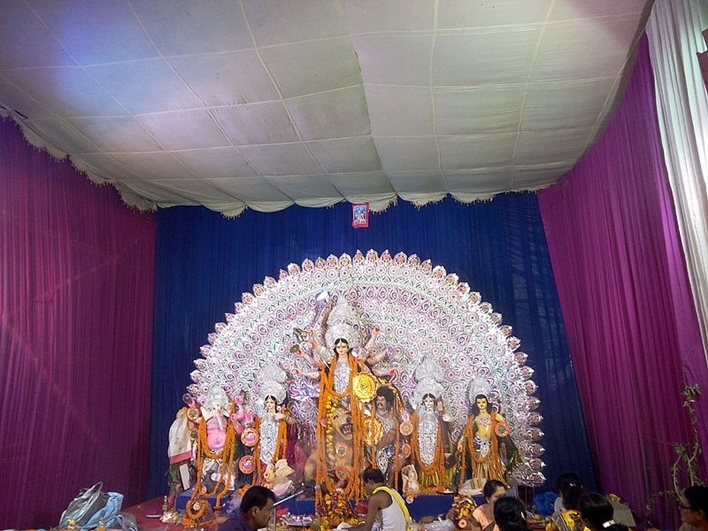 There are a number of Bengali associations in Bangalore that organize and host Durga Puja celebrations. The highlight of these Pandals is the idol of Durga. Each year, just before the festive season, a number of sculptors and artisans come to Bangalore to make idols. Along with their tools and artistic skills, they also bring with them clay from Kumartuli. This is believed to be the purest form of clay. Apart from these migrant artisans, there are a number of other artisans who have made Bangalore their home. These sculptors specialize in customized idols of Goddess Durga. Traditionally, the idol of Goddess Durga is sculpted with her standing over Mahishasura. Her left leg is usually placed on Mahishasura’s chest. This is referred to as her ‘Sanatana Roopam’. Instead of POP, the idols are made with clay and decorated with sholapith. This is a dry, spongy, milky white cortex of a plant that grows in the Hooghly River. When the idol is immersed in water after the festivities, the sholapith dissolves completely. Most Pandals will be opened to the public for six days starting from October 14th. They will be open through the day and entry is usually free. We encourage you to use Namma Metro wherever possible.